Sorry, sorry, I’ve been useless at updating – I’ve been busy knitting, crocheting and churning out home-sewn pyjamas and dresses for the minxes. After receiving a very kind email from a reader, I realised that some people might be wondering about how that mole got on. It’s fine – it was all clear. Yippee! Formally, it was an “irritated compound naevus”. I couldn’t care less if it were as grumpy as me; it’s no longer sitting there on my back, glowering at me in the mirror, growing at a rate of knots! It’s healing nicely into a properly interesting scar. It’s at a jaunty little angle, is the perfect line and ladder of a ‘pirate’ scar, and is a wee bit over 2 inches long with points at each end. I’m able to babywear again (gosh, how I missed that! 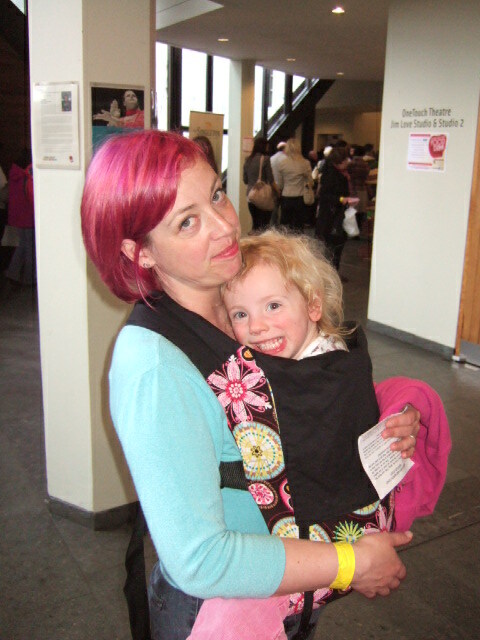 Mini begged for a Mummy-Connecta-snuggle on most of the 10 days that I avoided slings), and its removal didn’t cause much pain or irritation at all, really. The worst part was the waiting for the results. Isn’t it always the worst part? I’d been told I’d hear back from histology via phonecall within a week. After a week, then 2, I told myself that it was therefore definitely fine, otherwise I’d have heard. My heart stopped every time the phone rang. Which was lots that week – NSPCC seem to have me on speed-dial to persuade me to up my direct debit donations (no, and any more spam calls from them and I’ll have to stop my tiny monthly payment altogether, because it’s just being spent on marketing!!) Anyway, after nearly 3 weeks and hours on the phone, I hear the great news that it was completely benign. Magic! So that was last month. What’s been my excuse for not writing this month? Well, The Boss had a very eventful 4 days off work. In that time he had a job interview, got a job offer, we went house-hunting at the other side of the country, we started clearing stuff out the house to start decluttering, and we phoned some estate agents to come round to value the house. That was 3 weeks ago. Our house is now on the market, we have a lock-up (that’s bursting at the seams!) and we’re ready and willing and waiting for viewers! We’ve both spent every spare second either tidying or cleaning or selling or actively looking for a new house. It’s not been a pleasant experience, but we managed a few short trips to the new beaches out on the East Coast where we’ll probably be living, just to keep the minxes sane and exercised and able to tolerate house-hunting! This entry was posted in Uncategorized and tagged Connecta Carnival, estate agent, house sale, mole, new house, new job by GrumpyOldTrout. Bookmark the permalink.